Cornucopia subscribers receive a complimentary matching face towel with any order. It is not surprisingly, given its long bathing tradition, that Turkey was always famous for its towels. In fact, they invented the technique that makes loops on a piece of fabric and revolutionized our idea of what a towel really is. Today there is only one company left in Turkey still making thick, looped towels on looms; when made on a loom, the structure is much stronger than any factory made towel (Turkish or otherwise). These plush bath towels come from Jennifer's Hamam (not a bath at all, but a lovely mousehole of a shop in Istanbul's Arasta Bazaar featured in Cornucopia 50 that supplies the most wonderful handmade towels). Each towel measures a generous 100 x 180 cm (excluding fringe) and weighs an equally generous 1.25kg, being hand-loomed with exceptionally absorbant GOTS certified organic Turkish cotton threads. The selvage edge is verification that each towel is hand-loomed individually, a process that takes a skilled weaver a full 4 days. 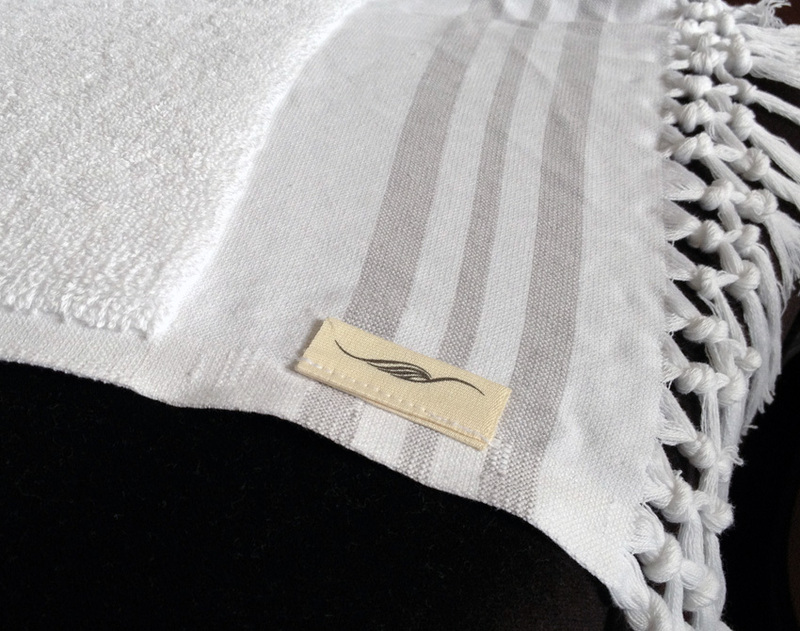 Each towel is beautifully finished with a hand-tied fringe. All orders sent will be of the same dye lot if it's the same colour and pattern. Dye lots may vary slightly with different orders. First wash: soak in cold water for 24 hours and hang to drip dry. ** Organic cotton is not absorbent to begin with and soaking can help speed the process of 'breaking-in' the cotton and assisting it to become more absorbent more quickly. ** BE SURE that the towel is completely saturated with water; you may have to use your hands to squish the towel and really work the water into the fibres; by doing so the cotton will become absorbent much quicker.